If you haven’t gone to confession in a while, Lent is the perfect time to reconcile yourself with God and the Church. Most parishes have communal penance services with prayers and Scripture readings, followed by the opportunity for individual confession (a necessity for absolution of mortal sins). Or you can also make a private appointment with a priest. Preparation for confession should include an examination of conscience, which means you think back on sins you have committed since your last confession. If you can’t remember the words or you don’t recall how long it’s been, don’t worry. Just tell the priest it’s been a long time, and he will guide you through the process. What you will experience is the healing gift of God’s love, the chance to start over with a clean conscience, and an overwhelming sense of gratitude. Recall your sins. Calmly and honestly ask yourself what you have done with full knowledge and full consent against God and the Church’s commandments. Did I put my faith in danger through reading material that is hostile to Catholic teachings? Have I been involved in non-Catholic sects? Did I engage in superstitious practices, such as palm-reading or fortune telling? Did I take the name of God in vain? Did I curse, or take a false oath? Did I miss Mass on Sundays or holy days of obligation through my own fault? Am I attentive at Mass? Did I fast and abstain on the prescribed days? Did I get drunk? Did I take illicit drugs? Did I consent to, recommend, advise, or actively take part in an abortion? Did I willfully look at indecent pictures, watch immoral movies, or read immoral books or magazines? Did I engage in impure jokes or conversations? Did I willfully entertain impure thoughts or commit impure acts, alone or with others? Did I use artificial means to prevent conception? Did I steal or damage another’s property? Have I been honest in my business relations? Did I tell lies? Did I sin by gossiping about others? Did I judge others rashly in serious matters? Christians know the life of a disciple will not be easy. Christ did not mince words about this — telling his disciples they must take on life’s sufferings as in the form of capital punishment that would later be used to take his life: “If anyone wishes to come after me, he must deny himself and take up his cross daily and follow me” (Lk 9:23). How do Christians make sense of the crosses they bear? The question of why suffering exists finds its answer in Christ’s transformation of suffering through love. Christ’s cross makes sense of our own, hence the universal appeal of popular devotions like the Stations of the Cross. The Stations of the Cross finds its roots with the Franciscans who helped rebuild the Christian sites of the Holy Land following the medieval Crusades. Given the prominence of Christ’s passion within Franciscan spirituality, the order encouraged pilgrims in Jerusalem to journey along Christ’s way to Calvary. While it began as a pious devotion, its enduring relevance in the Christian life, however, caused the devotion to spread. Over time, the pope gave Franciscans the prerogative to erect “stations” of the cross for popular devotion in parishes the world over. Eventually, the role of the Franciscans was eliminated, and yet it is hard to find a parish building or complex that does not have the Stations of the Cross. The universal reality of suffering makes devotions inspiring meditation on the passion and death of Jesus particularly relevant in Christian life. Such prayer forms like the Stations of the Cross are popularized particularly in the season of Lent. They should not necessarily be restricted there alone, however, since the Stations of the Cross have become a primary opportunity for the faithful to learn the purpose of their crosses. Through fostering communal celebration of the Stations of the Cross, priests have the privilege of accompanying their flocks in this understanding. Assisted by praying with the Stations of the Cross, the faithful enter into the experience of Christ and others — such as Pilate, Mary, Simon, Veronica, the women of Jerusalem or those who crucified the Lord. In this way, devotions like the Stations of the Cross assist the faithful in appropriating the fruits of Christian suffering. “For God so loved the world that he gave his only Son, so that everyone who believes in him might not perish but might have eternal life” (Jn 3:16). God is love, and love is the source of all that is. “Love is also,” Pope St. John Paul II wrote in his encyclical on suffering, Salvifici Doloris, “the fullest source of the answer to the question of the meaning of suffering. This answer has been given by God to man in the Cross of Jesus Christ” (No. 13). Out of love, Christ gave of himself completely, even unto death — handing over his spirit out of obedience to the Father’s will (see Lk 23:46). Christ’s own suffering and death has untold value and immense purpose — whereby God bought us back from the slavery of sin and death. So, too, does ours, because, as St. John Paul II described it, “each man, in his suffering, can also become a sharer in the redemptive suffering of Christ” (Salvifici Doloris, No. 19). Archbishop Fulton J. Sheen wrote: “The great tragedy of the world is not what people suffer, but how much they miss when they suffer. Nothing is quite as depressing as wasted pain, agony without an ultimate meaning or purpose.” The Stations of the Cross make real every imaginable aspect of human suffering that was on full display at Christ’s passion. And they teach us to see the fruit of suffering. On his way to Calvary, Christ experienced the sufferings ordinary men and women experience every day throughout the world. He showed not only how to deal with them, but through the power of love how to transform suffering’s destructive power into something life-giving. In Christ’s passion and death, St. John Paul II wrote that Jesus “has taken upon himself the physical and moral sufferings of the people of all times, so that in love they may find the salvific meaning of their sorrow and valid answers to all of their questions” (Salvifici Doloris, No. 31). Michael R. Heinlein is editor of Simply Catholic. Follow him on Twitter@HeinleinMichael. This article was originally published in The Priest magazine. There is both great joy and terrible sorrow associated with this day, the Sunday that begins Holy Week, the Sunday that portends the crucifixion of Our Lord. It is a time of despair, perplexity and contradiction. The very people who applaud Christ’s entrance into Jerusalem that morning, shouting out “Hosanna” and words of adoration will, within a week, be crying, “Crucify Him.” They will go from acclaiming Him as the new King of Israel to urging His life be traded in favor of a convicted criminal; they will first praise Him and then mock Him. Even friends entering Jerusalem at His side will desert Jesus. All this discord will take place during one week beginning on what we call Palm Sunday. As we read in the Gospels, Jesus went to Jerusalem to join with throngs of other Jews to celebrate the Passover feast as had been prescribed in the Old Testament books of Exodus and Deuteronomy. According to the Gospel of St. John, Jesus and many of his followers journeyed the less than two miles from Bethany on that Sunday, arriving outside Jerusalem. As was the custom, pilgrims that had already arrived in the city went out to greet newly arriving groups; some had never seen Jesus but had heard about the miracles attributed to Him and were caught up in the excitement. Those arriving with and greeting Jesus were large in number as explained by John’s Gospel: “When the great crowd … heard that Jesus was coming to Jerusalem, they took palm branches and went out to meet him, and cried out: ‘Hosanna! / Blessed is he who comes in the name of the Lord, [even] the king of Israel’” (12:12-13). This adulation was not lost on the Pharisees who were present. They said to Jesus, “Teacher, rebuke your disciples.” He said in reply, “I tell you, if they keep silent, the stones will cry out” (see Lk 19:39-40). The Pharisees reported the events back to the Jewish high council, the Sanhedrin, which regarded Jesus’ ever growing popularity as a threat to their cozy relationship with the Romans. They were, in fact, planning to murder Him. “Exult greatly, O daughter Zion! / Shout for joy, O daughter Jerusalem! / Behold: your king is coming to you; /a just savior is he, / Humble, and riding on a donkey, / on a colt, the foal of a donkey. / He shall banish the chariot from Ephraim / and the horse from Jerusalem” (Zec 9:9-10). Pope Benedict XVI explained these Old Testament words as they related to Jesus: “He is a king who destroys the weapons of war, a king of peace and a king of simplicity, a king of the poor.… Jesus is not building on violence; he is not instigating a military revolt against Rome” (“Jesus of Nazareth: Holy Week,” Ignatius Press, 2011, pp. 81-82). Riding on the borrowed donkey, Jesus made His humble entrance into the city while the crowds were scattering their garments before Him and waving their palm branches. This joyful scene belies the traitorous acts, sorrow and agony that will soon follow, belies that this triumphant hero will be crucified like a criminal. Palms were symbols of life among the nomadic tribes, who, when crossing the desert, rejoiced at seeing the palm tree as it indicated an oasis with life-giving water was near. Palms have long been a sign of victory, success and glory. Victorious armies or leaders returning from the battlefield or a long military campaign were welcomed by the populace jubilantly waving palm branches. Despite Jesus’ peaceful manner, when the Jews waved the palms at Him and spread their clothing over which He rode, they were affording Him the honors of a conquering hero and simultaneously defying the Roman occupiers. On Palm Sunday, we still go out to meet Him, carry the blessed palms, joyfully sing out our hosanna and join in His triumphant entrance into Jerusalem. But soon our joy turns to somberness as, clutching our palm, we hear the narrative of Christ’s passion. We realize, once again, that His triumph, His true victory, will come through the cross. We know, as Jesus did, how Holy Week will end. We know that joy will turn to sorrow and back to joy. We know that through the horror of His suffering, followed by the glory of His resurrection, good will trump evil and life will trump death. The palms we take home and put in a special place serve to remind us that Palm Sunday is not lost to the ages but that by Christ’s victory we, too, can achieve everlasting life. “For us too, they [palms] must be symbols of triumph, indicative of the victory to be won in our battle against the evil in ourselves and against the evil which roams about us. As we receive the blessed palm, let us renew our pledge to conquer with Jesus, but let us not forget that it was on the cross that He conquered” (“Divine Intimacy,” Father Gabriel of St. Mary Magdalen, O.C.D., Tan Books, 1997, pp. 392-393). Soon after the Resurrection, Christians wanted to visit the sites of Christ’s passion and even reenact the incidents that had taken place, such as His entry into Jerusalem. But such activity would not be possible until the fourth century when Constantine became emperor of the Roman Empire and ended all religious persecution. Later in that century, a Spanish pilgrim named Eigera visited Jerusalem. In her diary, she recorded how Christians re-created the events of Holy Week. She wrote that they gathered outside the city on the Sunday before Easter and listened to one of the Gospels telling of Christ’s triumphant entrance into Jerusalem. Then they marched together through the city gates while carrying olive or palm branches. Our Palm Sunday processions are akin to what Eigera witnessed 17 centuries ago. By the ninth century, the procession with blessed palms had expanded beyond Jerusalem and during the Middle Ages became widespread throughout Europe. In the 17th century Christians were not only processing into church with palms but, during Mass, holding the palms while the Passion was being read. Through the centuries, Palm Sunday and the procession of people holding palms would be celebrated in a variety of ways. In some locations the Blessed Sacrament was part of the procession, in other places the congregation started in the parish cemetery and then went into the church. Palms were sometimes blessed in one church and the people, carrying the palms, marched to another church for Mass. Most typical was the blessing of the people and the palms at a place outside the church and then processing in. For some time, even through the middle of the 20th century, the priest wore red vestments during the palm blessing and procession and then changed to a violet garment for Mass. In 1955, the Church standardized and simplified the different entrances used on Palm Sunday: either an organized procession that begins somewhere outside the church, a solemn procession starting inside the church, or no procession at all. An entrance procession beginning at a location outside the church is used only once during the weekend Masses; it is not repeated at every Mass. The Church calls this day Palm Sunday of the Passion of the Lord. D.D. Emmons writes from Pennsylvannia. Say the word “Easter” and most people will think of chocolate eggs, which is a pity, because it means so much more than that — in its glorious celebration of our redemption through Christ’s death and resurrection, and in giving meaning to every Sunday throughout the year. To understand Lent and Easter, we have to understand the greatness of God’s love for us. From the very beginning, He loved us so much that He sent His only Son to be one with us, to share our humanity and to bring every human being into a full and joyful friendship with God. Because of man’s sin, when the Son came to be with us, it meant a sharing in man’s suffering and death — even death on a cross — but in a mysterious sense this only served to reveal the hugeness of that Divine Love, and to draw us even more closely to God. And that is what Lent and Easter are all about. Lent is 40 days long — echoing the 40 years the Israelites spent in the desert while journeying to the Promised Land and Christ’s 40 days in the desert fasting and praying. Count up the days on a calendar: from Ash Wednesday to Good Friday is 40 days — omitting Sundays because every Sunday is a “little Easter” and doesn’t exactly count as Lent. The days before Lent are traditionally a time of feasting — carnival — to enjoy all the tasty things that we will deny ourselves during the time of penance. The word “carnival” comes from the Latin carnis, meaning meat, and vale, meaning goodbye: it was “goodbye to meat” once Lent began. The name Mardi Gras, or Fat Tuesday, echoes the same theme of eating lots of rich food! Eastern Catholics typically give up meat all of Lent, not just on Fridays. A British tradition is pancakes on Shrove Tuesday (the day before Ash Wednesday), served with brown sugar and wedges of lemon. The word “shrove” derives from the Saxon word for going to confession: we are “shriven” of our sins. Slavic peoples, particularly the Polish, serve paczki — a doughnutlike pastry that was made in order to use up all the lard, sugar and eggs to be given up during Lent. Part of the carnival tradition is the harlequin clown with the teardrop — a reminder that carnival comes to an end with Lent. Some Catholic groups hold a carnival party with pancakes, wine and plenty of good food — and then stop at the stroke of midnight and do all the cleaning up in silence to recognize Lent has started. Ashes are an ancient symbol of penance and mourning, since ash is what is left when something is consumed by fire. On Ash Wednesday, we receive ashes on our foreheads and are reminded to repent and believe in the Gospel. The ashes are customarily made from the palms from the previous year’s Palm Sunday. Some parishes invite everyone to bring along last year’s palms to be burned. Ash Wednesday and Good Friday are required days of fasting for Catholics between the ages 18 to 59 — meaning one main meal and two other light meals as needed to maintain health. Abstinence from meat is also required on those two days as well as on the Fridays of Lent. “Giving up something” is a standard form of penance today during the penitential season of Lent. Renouncing chocolate, alcohol, television, coffee or some specific favorite food are all standard penances. Money saved should go to charity as Lenten alms. At one time it was standard for all Christians to renounce all meat and dairy products during Lent, which included no cheese, eggs or milk. This is still practiced by Eastern-rite Christians. Hence the tradition that eggs were stored and then were in plentiful supply by Easter. Eggs can be kept from going bad by sealing them — so that no air can get in through the shell — with something sticky such as water glass (sodium silicate). In modern life, it is unrealistic to live with the diet of former ages, but penitential sacrifice is still a non-negotiable part of Lent. Some families institute a specific fasting meal each Friday: a simple supper with no trimmings. Parishes often organize bread-and-soup lunches, with funds raised going to a charity. Part of the Catholic tradition of fasting is that you are not meant to brag about it: no showing off about how pious you are, or how much you are suffering through your self-imposed penances! In fact, the best way to experience Lent is to see it as a time of genuine spiritual renewal — it’s a time for small but specific acts of love. Picking up some litter in the street and putting it in a bin? Making one random act of kindness every day? (It can actually be quite fun working out how to do that: a seat offered to a stranger on the bus, an angry remark left unsaid, a pleasant greeting to a colleague at work, and/or a decision to do something that you have been meaning to do for ages, such as visiting that home for the elderly and getting a group of friends to go and sing there, etc.). But it does have to be said that Lent’s 40 days can still seem horribly long! Which is why the Church gives us a mid-Lent Sunday, the Fourth Sunday of Lent. Its traditional name is Laetare Sunday, from the Latin word for “rejoice.” Look up the Mass prayers for that day and you will find them full of messages about hope and joy. It is sometimes called “let up” Sunday — you let up on your fasting and penance for the day. And so to the great events of Holy Week. It begins with Palm Sunday, when we carry palms in procession at church, honoring the entry of Christ into Jerusalem. A donkey carried the pregnant Mary on the way to Bethlehem, too. Incidentally, did you know every donkey has a cross on its back? (Next time you visit a zoo or a farm, check and see — you will find that it is so: a clear cross marked down the animal’s spine and across its shoulders. Christians have seen this as a mark of favor, because a donkey carried Christ long ago). We bring our blessed palms home and are encouraged to put them around the house, up behind the kitchen clock or behind a crucifix on the wall. In Holy Week, there is a sense of drama: Wednesday is known as Spy Wednesday because of the betrayal of Christ by one of His own followers. Holy Thursday is sometimes known as Maundy Thursday, from the Latin mandatum, which gives us the word “command.” We are meant to remember the command that Christ gave us on the night before He died, the one we all forget — that we should love one another. Love involves service: Christ washed the feet of His apostles, and on Maundy Thursday, all over the world, priests will re-enact that act of service by washing the feet of 12 of their parishioners. During Holy Week, all the priests of a diocese gather with their bishop for the Chrism Mass. All walk, donned in white vestments, in procession. The Chrism Mass is often packed as people love to be there to see their own priest and to express their thanks for all that he does. At this Mass, the sacred oils that will be used for baptism, confirmation, anointing of the sick and ordination during the following year are blessed and consecrated by the bishop. The oil is preferably olive oil, and the prayers at the Chrism Mass remind us of the olive branch that the dove brought back after Noah sent it out to seek land as the flood subsided. On the evening of Maundy Thursday, we celebrate the Mass of the Last Supper: listen carefully to the words of consecration. The priest says, “On the night before he suffered — that is, tonight … ” It is usual to have holy Communion offered under both forms — the Host and the Preciuos Blood — on this night. We remember the Passover and think of the Jewish people and their allegiance to the one true God. We remember that they remained faithful to the Passover and still do. One day we will all be united, Jews and Christians together, when Christ returns to gather us at the end of time. Holy Thursday evening through Easter Sunday evening is a liturgical season of its own called the Sacred Triduum — the three holiest of days. Good Friday is a solemn day: fasting, abstinence from meat, a day to think about all that Christ did for us. Hot cross buns are a traditional way of remembering. Originally, people ate dry bread rolls topped with a pastry cross — over the centuries currants and spices got added, and the cross is still there. We will spend much of the day in church: perhaps the Stations of the Cross in the morning and then, of course, the solemn commemoration of Christ’s passion, traditionally held at 3 p.m. It is always a powerfully moving sight to see the priest prostrated in prayer and mourning at the start, lying full-length on the floor. And we think of our sins and about how often we have failed Christ. It’s the only day the Church does not celebrate the Mass. Many towns and cities have a Good Friday Way of the Cross with Christians carrying a large cross through the streets. Each year the pope conducts a special celebration of this in the historic Roman Colosseum, a place Christians were once martyred. Praying the Stations of the Cross is a staple Lenten devotion, with roots dating back to the earliest Christians who literally would retrace the steps of Christ’s passion and death — His journey from Pilate’s praetorium to the tomb. Holy Saturday is a time of preparation for Easter: decorating Easter eggs, organizing the upcoming Easter breakfast and Easter lunch. You can buy special packs with dye and stickers for decorating eggs, and it can be fun to experiment with natural dyes. Eastern Christians dye their eggs red to symbolize the blood of Christ outpoured on Good Friday, and the hard shell signifies His sealed tomb. 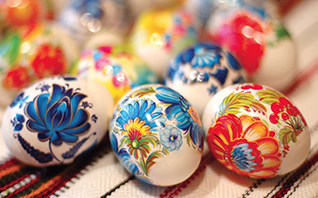 Some Easter eggs are extraordinarily decorative — consider the beautiful products of the Ukrainian wax-resistant method. 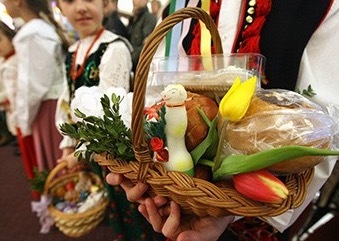 Many in the United States, especially those of Polish descent, bring baskets to church with their Easter foods for the priest to bless. The traditional foods contained in the baskets have meaning: eggs, symbolic of life in the Resurrection; bread, symbolic of Jesus’ body; lamb, symbolic of Jesus’ divinity; salt, representative of purification; horseradish, symbolizing Christ’s passion; and ham, signifying the joy and abundance of the feast. Holy Saturday night is the Easter Vigil. It begins with a magnificent fire symbolizing Christ, the Light of the World, who dissipates the darkness of sin and death as He passes over from death to life. There are usually seven Old Testament readings during the Easter Vigil Mass, which recall the story of salvation history. New Christians enter the Church that night, too, by receiving the Sacraments of Initiation (baptism, confirmation and Eucharist). Jesus speaks: A pagan judge, Pontius Pilate, saw through the deceits of My accusers, My own countrymen, over whom I had wept. In an effort to save Me, he had Me scourged. The Roman soldiers then added to this by mocking Me and crowning Me with thorns. But Pilate’s words: “Behold the man,” aimed at stirring up pity, only stirred renewed cries of “crucify Him, crucify Him.” So, weakly, fearing for his own political skin, he went on to condemn Me to death by crucifixion. I respond: Sometimes, Jesus, when I hope for pity or at least consideration, I am passed by in silence that tells me the other person is not interested. Sometimes I am reproved instead, even mocked for clumsiness or lack of comprehension. Words float back to me, snatches of conversation I’m not supposed to hear. They cut like scourges. My head may throb in frustration, recalling Your crown of thorns. Of course, sometimes my own exaggerated feelings invite such humbling hurt. Help me, Jesus to remember You, condemned to death, yet most innocent of all wrong and good to all. In my heart may the hope of Pontius Pilate when he said; “Behold the man,” come true. May it be a heart turned in pity and sympathy to You. Jesus speaks: I had been looking forward to My final hours. Yes, I looked with both longing and with sadness and dread. In the prime of My vigorous manhood, the Father was calling for Me to give up life. My human nature, complete like yours, could feel the sadness and dread of approaching death. I knew ahead of time the sufferings and the manner of death. The prophecies and the hearts of My enemies told Me. My prayers always to do the will of the Father made Me more certain of the Father’s plan. It had to represent the most complete giving clearly, so all men could understand the completeness of My love for them and the justice and mercy of the Father. The thought of it in the garden made Me sweat blood. Now the cross-beam was laid on My shoulders. The weeks and days had passed. The final hours were here. I respond: Lord Jesus, in my later years the thought of approaching death comes more often. For me, too, it brings a combination of longing with sadness and dread. I long to see You face to face, to meet our Mother Mary and her loving husband, Your virgin-father, Joseph. My reading and the Church’s liturgy have made me a friend of many saints. I look forward to meeting them. Many relatives and friends have gone before; my guardian angel is waiting. But the barrier of death is a blind barrier. Faith tells me of the unknown on the other side. But the thick dark side here looms before my earthly eyes. Then, too, this world is beautiful with its changing seasons, its flowers, its sunrises and sunsets. There are good friends here, too, and dear relatives. I ask Lord Jesus, to embrace my final Cross, signifying death, with courage, to meet it with open eyes, to offer it and accept it as joined to your Cross, as the plan of the Father for me. Jesus speaks: In the garden of My agony, when the soldiers seized Me, I said, “This is your hour and the power of darkness.” I also reminded Peter, who drew his sword, that I could ask the Father and He could send Me legions of angels to defend Me. But for now, the plan of the Father called on Me to rely only on My ordinary human abilities. And these, just like yours, are subject to loss of blood, to fatigue, to the emotions. So, it was that soon after taking up the cross, I fell, much to the merriment of some bystanders. Laughter and uproarious shouts of amusement rang in My ears. I respond: I understand, dear Jesus, how You felt, for it happens more often now that I am old, that some bodily or mental weakness makes me do or say things that cause embarrassment. It is not a fall to the ground, of course, but a fall from the image of strength and sureness I like my friends and companions to see. Help me to accept facts and not hide in some imagined cocoon transparent to others. Let me rather learn to have that transparency of simplicity that befits a humble soul. May my guardian angel help me from putting on a false front. Jesus speaks: Five days ago, a woman watched people wave palm branches, sing out their “Hosanna” welcome and spread garments before Me. She stood along the way, hoping, praying that somehow, as in the case of Abraham and Isaac, the Father would not demand the supreme sacrifice of her Son’s life. Yes, it was My own dear mother who watched on Palm Sunday. Now she stands again and watches the waving palm of yesterday replaced by the menacing fist of today. We don’t need to speak to each other. She looks at Me. I look at her. The story is complete. She knows this has to be the last chapter. I respond: Lord, thank You for giving us this glimpse into the sorrowful heart of Your mother, more sorrowful than others because it is immaculate. The heart completely untainted by sin can love You in the most complete way. But untainted hearts (or purified hearts) can also enter more deeply into the pain of Your most sacred heart. Their love is the measure of their sorrow. A person like Your mother does not need to wail and weep aloud or exclaim. One tear glistening on her cheek proclaims the silent profusion of the tears of her sorrow for You and her forgiving love for all of us. Help me to know that one touch on the shoulder, one compassionate glance or a written note from a relative or friend often tells me more than a torrent of words. Jesus speaks: The Father knows everything. Take this meeting along the way to Calvary. Simon of Cyrene came to Jerusalem for the great holy days of the Passover. He was one of millions gathered in the holy city. To the soldiers who grabbed him and forced him to help Me, he was just one of a milling, jostling crowd. He looked strong. To my Father, he was a man chosen to be at that spot at that time. (Did My mother, in her quiet way, help?) To the eyes of the crowd and in the laughter of some, he was the unlucky one. But You know he was the chosen one. That is why You know his name today. I respond: Yes, Lord Jesus, I understand that what the majority of people think little of is often great in the eyes of God. Those who laughed at Simon or counted themselves happy not to be in his place were the less favored. I’m sure that some people account me ill-favored. They notice my halting words as I struggle to remember. They see my stiff way of walking. They see the sick and the old not able to walk. Some are confined to the wheelchair, some to bed. Yet in the gracious plan of the Father, as Francis de Sales said, God has seen this moment from eternity. Help me to recognize the moments of grace in my life, and say, “Thanks be to God,” whether the moment is one of joy or sorrow, of acceptance or rejection by the crowd, whether one fold or one of a long string of painful moments. May my every moment be a Simon-moment, helping You to carry the cross of salvation. Jesus speaks: Veronica represents many good women who did acts of kindness for Me. Her name means true image. She also represents many good women who do acts of kindness to others for love of Me. As long as you do something for the least of My brothers in My name, you do it for Me. In each case My image is impressed on the heart of the one who helps the cause of justice or does the work of charity. I respond: Yes, Lord, I understand that in all persons who have a need, whether for food or drink, for clothing, for consolation or for any of the spiritual and corporal works of mercy, we should see You. They are all on their struggling Way of the Cross. Every true act of love for the least one, done for You, will leave an impression on our hearts. We also know that the same works for those who aid us in sickness or in the weakness of old age. So then, teach us to accept help in this way when we need it. The help given us in Your name can also impress Your image on the hearts of our helpers. Whether we help or are helped, our hearts can always grow lighter as we understand this truth. Jesus speaks: There is a sharper interior pain when, after being helped, you find yourself again helpless. My mother Mary, Simon and Veronica had just provided Me in different ways a new courage. Now My mother’s face had faded into the nameless and blurred faces of the crowd, among them the taunting with their lips curled, the Veronicas pressing the veils of memories past to their hearts. Simon helped carry the patibulum (crossbar), but My feet still refused to carry Me. Now I stumbled and My face lay in the well-trodden dust of Jerusalem. This brought renewed, sharp pain from the crown of thorns. But the sharper pain came from the thought of falling just after being helped. I respond: Lord Jesus, I know how this is. Kind relatives and friends come to comfort me, to try to raise my spirits, to take my mind from the aches of the body, to pass an hour with me on the back porch of memories stored. Then before long, some new demand of the body intrudes. Some rude reminder jumps at me from the lips of a tired, overworked nurse. Some new doubt comes to cast a blurring shadow across my conscience. After being helped, I’m again helpless. There is nobody who could be expected to understand. Show me then, Jesus, how to get up again and go on. You promised that Your yoke would be easy and Your burden light. These are the words I spoke to the weeping women who stood along the way, their frightened children clinging to their garments. I was not refusing their tears, but remembering tears I had myself shed over Jerusalem. How often my heart had yearned for that city, so rich in the history of My people, made holy by its temple, enshrining the memories of so many of My Father’s great servants. But the yearning of My heart met only the pride and refusal of those hearts turned against the truth. The shaft of truth’s arrow could not pierce the armor of pride, sin and blind preconception. No. I did not refuse tears, but looked beyond to the tears of these clinging children in their adult years. Not a stone would be left upon a stone. There would be none to dry the tears of their children. I respond:Yes, Lord, there were tears along the way to the hill of the skull. The pity Pontius Pilate tried to arouse when he presented You to the crowd brought not tears but jeers and renewed shouts of, “crucify Him, crucify Him.” Pilate’s efforts were further rebuffed by Your enemies’ choice of Barabbas, a criminal, over You, the man of perfect innocence. But here on the cheeks of these weeping women is the answer Pilate sought in vain. And in their hearts was the answer he wanted. Help us, Lord, as we grow old in years, not to grow in hardness of heart, refusing to drop an ancient grudge, to forgive the injury we still remember even as we become more forgetful of other things. This puts us in the company of those who chose Barabbas. Help us rather to join the holy women who wept over You. Jesus speaks: There is a strong contrast between a person standing and a person fallen or lying on the ground. There is also a big difference between one who walks with confidence and ease and one who stumbles and sways. People ask, “What is the trouble?” Good people gather around the fallen person and try to help. I respond: Yes, Lord, we know You took on the fullness of our weak human nature. You experienced everything except sin. We want to join you in accepting the weakness more often felt with advancing age, the greater dependence on others’ help. We remember the scampering of our youth, the proud, sometimes proud stride of maturity. Our gait now is uncertain, sometimes stumbling. Some of us fall and break bones. Help us to offer our dependence on others, our helplessness joined to Yours, as the force behind our hope and longing to help others reach heaven. Jesus speaks: At the beginning of My life, My mother wrapped Me in swaddling clothes. That was not far from here, a few miles away at Bethlehem. Her hands had the careful, gentle touch of all young mothers. She brought with her the recent skill of helping her cousin Elizabeth with the infant John. Now the soldiers pull away My garments. They cast lots for the seamless one. The scourging had left my body a mass of wounds. Now the rivulets of blood flow again. There is new pain. There is worse pain — from embarrassment. I offer everything to My Father. I recall the words of Job: “I came naked out of my mother’s womb, and naked shall I return thither” (Job 1:21). My mother recalls the swaddling clothes, the many garments that through the years her hands have made for Me and for Joseph, given to be My father on earth by My Father in heaven. I respond: Lord, sometimes in sickness or old age, we go back to the dependency of infancy. We need help in clothing ourselves, in divesting. It certainly affords a great time for exercising humility, for realizing how caring even for the very simple needs of life can be beyond us. So, especially in these times we offer the pain of dependency to atone for sins against modesty, our own and others’. We also ask for those suffering from cold because they lack suitable lodging and clothes. Jesus speaks: The devotion of the good people who have walked with Me the Way of the Cross has long counted three falls. Now there can be no more, for my feet are nailed to the cross. A long spike has torn through flesh. It has separated and crushed bones. My ordinary earthly journeys are ended. My feet can no longer bear Me to the desert to enjoy its quiet and solitude in prayer to my Father. They cannot carry Me to the temple nor to the homes of My friends; neither can they take me to fishing boats nor bear Me to the gathering places where in the open air I proclaimed the Kingdom. My hands, pierced at the wrists, cause Me more pain than the feet, for here the big nails rub against a large nerve center. But each shooting pain is an arrow that wings its message of utmost love, even to those who have nailed shut the doors of their hearts. I respond: Lord, we thank you for explaining. Sometimes the pains of advancing years make a person fretful. The pain echoes in the violence of our speech. Help our relatives and friends, our nurses hear more the message of discouragement and pain rather than the exact meaning of the words that burst from our lips. Help us to remember Your silence before Your judges, to recall Your words turned not to accuse or shout, but rather telling in renewed prayer to Your Father that Your heart is not nailed but free and gentle. Father, forgive them for they do not know what they are doing. Jesus speaks: One day a young man asked Me what to do to reach the kingdom of heaven. We counted up the commandments of God and he said: All these I have kept. But he turned away from my invitation: If you would be perfect, go sell all you have and give to the poor and then come, follow Me. There was the same need for Me in following the will of the Father. My preparation for the three hours on the cross was living the poverty of the 30 years. Not only the poverty of giving up all that men could see, the exterior lack of possessions. It was the interior poverty of giving up all that the spirit cries out for. On the cross, My words to John and to My mother bespoke the fullness of that poverty. The last wrench of My heart was breaking the bond of filial possession by this visible giving My own mother to the beloved disciple. First I forgave those who hurt Me most, then promised heaven to the thief on my right. After giving My own mother to John, there remained only to feel even the separation from My father in heaven. My God, my God, why hast thou forsaken Me? My full thirst to please Him and save souls complete, My will to live had run its course, and I, at last, can cry from the cross: Father, into Thy hands I commend My spirit. It is finished. I respond: Yes, Lord, we see now that the way of poverty is the way to perfection. It is not just the poverty of not having money or home, recalling what You once said that the Son of Man had nowhere to lay His head. It is the poverty of losing the strength of the body, sometimes the clarity of the mind. It is the giving up of the final clinging to a grudge, to ill will, resentment, self-pity. The poverty insuring perfection may mean accepting the neglect of friends and family, of being forgotten. Jesus speaks: My mother was not able to comfort Me as all good mothers would do, by soothing My brow, by clasping My hands. They were nailed above — My head was covered by the crown of thorns. She had held Me as an infant, kissed away the pains of tumbling boyhood’s scratches and bruises. Now she holds again My body, a mass of bruises, cuts, wounds. She is the first of all to enter into the union of suffering with Me for the redemption of men. As my apostle Paul later was to write, “I rejoice now in my sufferings for You and fill up those things that are wanting of the sufferings of Christ in my flesh for His body which is the Church.” (Col 1:24). Nothing is wanting in a bare, absolute sense but My Father’s plan extends to others the gift of joining in My redemptive suffering. Wasted pain is a great loss because there need be no wasted pain if those who have faith in Me will only exercise that part of the faith that invites them to be joined with Me in my redemptive suffering. I respond: Yes, Lord, we understand pain only when we understand that it is conscious redemptive suffering, or it is a preparation for such union with Your Cross. We are grateful to Christian art for giving us touching paintings and statues of Your mother holding Your body just taken from the cross. Help us to be stirred not only to natural pity, but more to fruitful imitation of Your mother and ours in suffering with You for the salvation of souls. The assurance that pain need not be wasted, that it fulfills the plan of the Father is comforting. This assurance is a great gift of advancing age, when discomfort and pain await our calm embrace. May Mary teach us her way. Jesus speaks: Once my voice called out, “Lazarus, come forth,” and My friend, four days in his tomb, rose from the dead. You can see now the completeness of the gift My Father asked of Me. The voice that calmed wind and sea, called the dead back to life, rebuked demons, is stilled in death. The hour of cruelty came, the forces of evil triumphed, the earth trembled and the midafternoon wore the black garments of night in mourning. A friend, Joseph of Arimathea arranged with Pontius Pilate for the burial. He gave his own tomb, hewn in the rock nearby. My disciples went into hiding; the violence had drained their courage. As the Father had asked the utmost of Me, He asked the utmost of them in paying the price of dashed hopes and the coin of confusion about a trusted leader fallen. They struck the shepherd, and the sheep fled. I respond: Yes, Lord, once you said the foxes have lairs and the birds of the air have nests, but the Son of Man has nowhere to lay His head. Your final poverty is death. Its exterior wrapping and evidence is the tomb. But we know it is “only a borrowed tomb.” We join in the sorrow of Your mother, of Joseph of Arimathea, Mary Magdalene and John and the women who laid Your body to hasty rest. They would return to complete the burial with more care and ceremony. But the tomb would be empty. We ask, Lord Jesus, as our time of death comes closer, to remember more often the day when our now-failing bodies will be restored to life and vigor, and we will join You in happy resurrection. Father Christopher Rengers, O.F.M. Cap., writes from Washington, D.C. This article was originally published in OSV Newsweekly.